Barney Bear's nephews, Fuzzy and Wuzzy, who originated as separate characters, only gradually became closely attached to him. Porky Pig's nephew, Cicero, didn't seem to make a huge impact on his life. And Woody Woodpecker's niece and nephew, Knothead and Splinter, started out as non-related supporting characters before being grafted on as relatives. Donald is the only major funny animal to have gone from carefree youth to responsibility-laden family man in a single catastrophic event. That event is generally held to have occurred in the Walt Disney cartoon Donald's Nephews, which was directed by Jack King and released April 15, 1938. In it, Donald received a note from his sister Dumbella, informing him that his three "angel nephews" were there for a visit, and giving no details — such as when they were expected to go back, which they never did. In fact, Dumbella was never seen or heard from again. But like Baby Huey and José Carioca, their actual first appearance was in comics. They were introduced in the Donald Duck Sunday page for October 17, 1937, and it was this appearance that inspired the cartoon. The writer and artist were Ted Osborne and Al Taliaferro, respectively, both of whom had long and distinguished careers in Disney comics. In this version, more details appeared in the note, such as the reason for the visit (their father was in the hospital because a firecracker had exploded under his chair); and the person signing the note was named Della. Disney fans have speculated that Della may have been someone other than the boys' mother, or that either Della or Dumbella is a nickname for the other, but a more likely explanation for the discrepancy is that they simply hadn't thought of the name "Dumbella" yet. 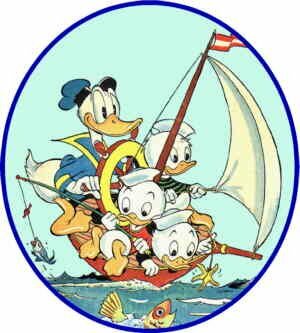 The nephews quickly became a constant presence in Donald's life, in both comics and cartoons. When, in 1943, cartoonist Carl Barks started writing and drawing a ten-page lead story about Donald every month for the anthology comic book Walt Disney's Comics & Stories, the nephews were a constant presence there as well. It was in a 1951 issue of that title, that Barks created their Scout-like organization, The Junior Woodchucks. They were there when Donald got his own comic book, too. In fact, they've been with Donald in all his venues — Little Golden Books, Big Little Books, and every conceivable type of merchandising product, from their introduction to the present day. Since the 1950s, they've even been starring in occasional comic books of their own, such as Dell's Huey, Dewey & Louie Back to School special. In the 1990s they had their own TV show, Quack Pack, in which they were depicted as teenagers, but the show didn't last long and neither did the aging they underwent for it. As identical triplets, Huey, Dewey and Louie are impossible to tell apart — except by the colors they wear, and historically, that isn't consistent. It's only in the last couple of decades that they've become standardized as red for Huey, blue for Dewey and green for Louie. Complicating this scheme is the phantom fourth nephew, who has been spotted in occasional comic book panels over the years, a result of artistic errors that go uncaught by editors and proofreaders until it's too late to take him out. His name (bestowed by editor Bob Foster, who also created Myron Moose) is Phooey, and nobody is quite sure what color he wears. Text ©2003-07 Donald D. Markstein. Art © The Walt Disney Company.